When someone or something is described as “eccentric,” it often has a negative connotation. Interestingly, that’s also the case with training programs that emphasizes eccentric training. However, the reason is that the eccentric phase of a weight-lifting rep is often referred to as the “negative,” the portion of the rep where the muscle fiber increases in length, or the active lengthening on fibers under load. Most people, especially strength athletes and bodybuilders, tend to emphasize the concentric phase of the repetition because that’s where they feel the contraction and pump in target musculature. This leads to the specious conclusion that you should always emphasize the concentric phase of reps and learn how to “rest” during the eccentric part, saving your energy for contracting your target muscles. But nothing could be further from the truth when you want to get the most from every rep. If you want to maximize your strength and hypertrophy progress, then you need to emphasize both phases of the rep. Because you’ve probably been over-emphasizing the concentric element, eccentric training teaches you how to integrate this science-supported aspect of training into your workouts using four specialized techniques. Here’s more on how eccentric training works and how you can incorporate it into your strength training programs to maximize your results. When the force produced by your target muscle exceeds the force applied to it, your muscle will shorten or contract. For instance, when you’re performing a biceps curl with a 50-pound weight, you’re applying more force than the weight is when you begin to lift it toward your shoulder. When the force applied to your target muscle exceeds that produced by the muscle, it will lengthen or act eccentrically, which occurs during the descent of the weight lowering your arm back toward your hip. Interestingly, it’s the eccentric or negative phase of a weight-training rep that gives you the most bang for your buck when you know how to use this phase properly. Employed correctly, the eccentric phase produces greater forces, estimated to be 20-60% more than those of the concentric phase for helping you build strength and increase muscle mass. In addition and while both concentric and isometric muscle contractions elicit a hypertrophy responses, numerous studies have reported that eccentric actions may have the greatest effect on skeletal muscle growth (1-3, 6, 7). Both physiologically, and practically, it makes a certain amount of sense, as stretching these muscle fibers encourages the type of stress, and even muscle damage that requires your body to build new muscle cells during the recovery and regeneration process, which ultimately leads to increases in both strength and hypertrophy. The response to damage from eccentric training is thought to be associated to a mechanical disturbance of the muscle contractile process leading to greater stress and strain on the muscles compared to other muscle actions. Part of the damage response from eccentric training, or normal training, is important, as muscle damage is one of three mechanisms that help promote and maximize muscle hypertrophy. In addition, the energy cost of eccentric exercise is comparably low, despite the high muscle force being generated. This makes eccentrics an appealing strategy for those wishing to gain additional strength and hypertrophy due to the fact that more volume can be performed without excessive fatigue. Exercise-induced hypertrophy from eccentric exercise is likely manifested by greater muscular tension under load, a situation that has been explained to represent a reversal of the size principle of motor unit recruitment, resulting in fast twitch motor units being recruited earlier in the muscle contraction process. (8)Eccentric training not only benefits healthy adults and athletic populations, but these benefits also extend to a number of clinical populations (4, 5). Research shows that resistance-training protocols that specifically emphasize eccentric training result in greater strength and hypertrophy than those that emphasize concentric exercise alone. Of course, emphasizing both is better than either alone. But you probably aren’t emphasizing eccentric training nearly as much as concentric training. These are the specific eccentric training protocols and techniques that you include in your regular training. To perform this eccentric protocol, you move the weight through the concentric phase using two limbs. Then you move the weight back to the starting position, through the eccentric phase, using only one limb. The amount of weight should be light enough that you can push or pull through the concentric phase as quickly as possible, but heavy enough to challenge your target muscles through the eccentric phase. Choose a weight that’s about 70-percent of your one-rep max. For leg presses, use both legs to press the weight up. Then take one leg off the platform and lower the weight with the active leg, taking three to five seconds to lower the weight. Perform three to five reps for that leg, then rest for about a minute before performing the reps for the other leg. Then rest another minute, before starting your second of three sets. You can also you use this technique for body parts such as shoulders and chest when you’re on a machine that doesn’t require each side to work independently. For this protocol, you pair a compound (multi-joint) move with an isolation exercise for the eccentric portion of the lift. The purpose is to activate all the muscles of this complex or groups of muscles, especially targeting the negative portion of exercise of your isolation move. Examples: Power cleans with reverse curls; close-grip bench-presses with triceps extensions. Choose a weight on a barbell that’s about 90-110% of your one rep max for triceps (close-grip) bench press. Lying on a bench, press the weight up for the close grip bench press (the concentric portion of the triceps press), lowering the weight toward your forehead or beyond, taking five seconds for this eccentric portion of the rep. Press the barbell back up to mid-way point of the close-grip press and lower the weight back to your chest (you can take five seconds to perform this eccentric portion of the second move, as well). Again, the volume and load parameters should consist of 90–110% of your maximal load while incorporating four to five sets of five repetitions with an eccentric duration of five seconds with one to two minutes rest between sets. This one’s fairly obvious, and you’ve probably incorporated aspects of it your training. After you lift a weight concentrically for a particular exercise, you then lower or perform the eccentric phase more slowly or for a longer eccentric duration. Specifically, execute an enhanced eccentric duration/slow eccentric phase while concentrically lifting the bar explosively. While this is one of the most common eccentric exercises, many strength and muscle-building athletes are resistant to it because it compromises your ability to pump out more reps or lift more weight during your current training session. The net result, though, is greater strength and enhanced muscle mass. Examples: This technique can be used for virtually any exercise where you want to increase strength or muscle mass. Regardless of the muscle group or exercise, you should target about 60-85% of your one-rep max. 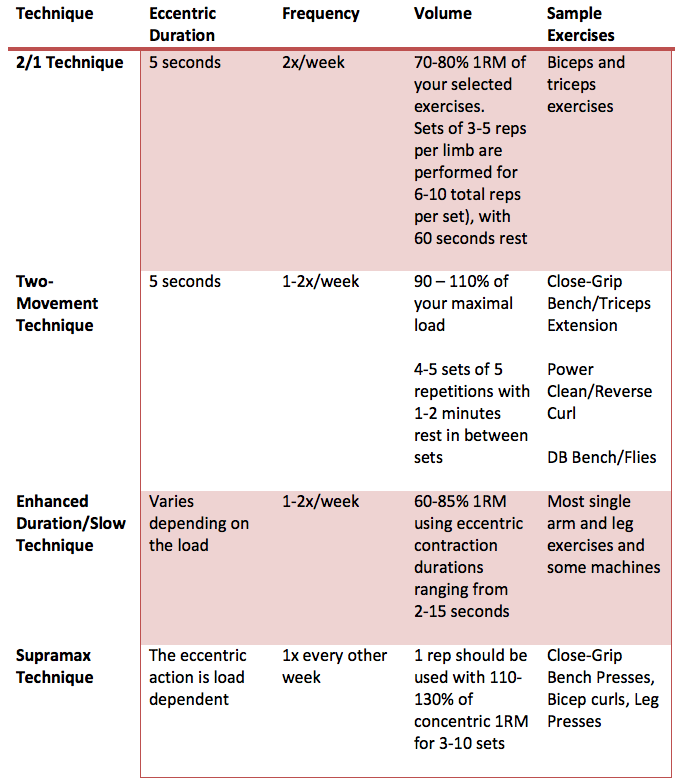 Of course, the length of time that you can perform the eccentric phase of the rep will vary by the weight you choose. Let’s say that your one-rep max for bench press is 300 pounds. Then your 60% weight is 180 pounds. You should take about ten seconds to lower this weight to your chest, then explode the weight up through the full range of motion. If you go with 255, though, you should only take about four seconds to lower the weight. In either case, a load ranging from 60-85% 1RM is commonly employed using eccentric contraction durations ranging from three to 12 seconds for three to five sets of five to eight reps depending load, type of movement, and size of muscle group. A rest period of 60 seconds is typically used that could be further modified depending the training status of the individual. The Supramax Technique relies on using more weight than you can lift, so it’s an absolute necessity to have a spotter if not two or three for many moves. For this technique, you perform the eccentric-only portion of an exercise, allowing your spotters to do much of the work through the concentric phase. In other words, for the concentric phase you’ll only “spot” your spotters, helping them return the weight to the starting position. Examples: You can use this for many exercises such as bench presses or extremely heavy barbell curls or close-grip bench press. Keep in mind that spotters are crucial and they must be able to lift the weight with little help from you. Perform only one rep. With a load of 110-120% of your one rep max, take eight to ten seconds to perform the eccentric phase of the rep. For instance, take eight to ten seconds to lower the weight. If you want to increase the weight to closer to 130% of your one rep max, then you should perform the eccentric phase for only four or five seconds. Because you only perform one rep per set, you need to perform several sets. Start with three sets and progress up ten sets. This technique places a large demand on your nervous system, so added recovery is encouraged, and to not progress to quickly, which may lead leading to under recovery. You should only include this technique once a week until you’re well accommodated to it. Here’s a summary of the techniques and exercises that you may wish to include in your weekly workout to take advantage of the strength and hypertrophy advantages of eccentric training. Note that you can make many substitutions based on how you like to construct your program, and whether you’re emphasizing strength or hypertrophy. After a four to eight week break, you can perform another phase of eccentric training. Keep in mind that you don’t need to include these techniques for every training session, and that these techniques are in addition to the others you’ll perform during your own workouts. Note that you should only include eccentric training for one exercise or pair per workout for the first two to three weeks to allow your body to adapt to any and all additional stresses of these techniques. Hather BM, Tesch PA, Buchanan P, and Dudley GA. Influence of eccentric actions on skeletal muscle adaptations to resistance training. Acta Physiol Scand 143: 177-185, 1991. Hortobagyi T, Devita P, Money J, and Barrier J. Effects of standard and eccentric overload strength training in young women. Med Sci Sports Exerc 33: 1206-1212, 2001. Hortobagyi T, Hill JP, Houmard JA, Fraser DD, Lambert NJ, and Israel RG. Adaptive responses to muscle lengthening and shortening in humans. J Appl Physiol (1985) 80: 765-772, 1996. Lastayo P, Marcus RL, Dibble L, Frajacomo F, and Lindstedt SL. Eccentric Exercise in Rehabilitation: Safety, Feasibility and Application. J Appl Physiol (1985), 2013. Lorenz D and Reiman M. The role and implementation of eccentric training in athletic rehabilitation: tendinopathy, hamstring strains, and acl reconstruction. International journal of sports physical therapy 6: 27-44, 2011. Nickols-Richardson SM, Miller LE, Wootten DF, Ramp WK, and Herbert WG. Concentric and eccentric isokinetic resistance training similarly increases muscular strength, fat-free soft tissue mass, and specific bone mineral measurements in young women. Osteoporos Int 18: 789-796, 2007. Roig M, O’Brien K, Kirk G, Murray R, McKinnon P, Shadgan B, and Reid WD. The effects of eccentric versus concentric resistance training on muscle strength and mass in healthy adults: a systematic review with meta-analysis. Br J Sports Med 43: 556-568, 2009. Shepstone TN, Tang JE, Dallaire S, Schuenke MD, Staron RS, and Phillips SM. Short-term high- vs. low-velocity isokinetic lengthening training results in greater hypertrophy of the elbow flexors in young men. J Appl Physiol (1985) 98: 1768-1776, 2005.